There are few things more central to life on earth than water. It dominates the physical landscape, covering much of the planet as oceans. It's also a major component of the human body, comprising, for example, more than 70% of the mass of a newborn baby. Yet despite its omnipresence, water has many physical properties that are still not completely understood by the scientific community. One of the most puzzling relates to the activity of water molecules after they undergo a process called "supercooling." Now, new findings from Roma Tre University, in Rome, Italy, on the interactions of water molecules under these exotic conditions appear this week in the Journal of Chemical Physics. "Normally, when liquid water is cooled below its freezing point, the water molecules arrange themselves in the ordered, crystal structure that is ice," said Paola Gallo, an associate professor of physics at Roma Tre University. "With supercooling, special techniques are employed to cool water very quickly in such a way that it remains a liquid even though its temperature has been lowered well below its freezing point. There are a number of anomalies in water molecules' activity in these supercooled conditions that have not yet been fully explained." Using a computer-based simulation, Gallo and her colleagues shed light on a thermodynamic property of water that helps explain how water molecules in a supercooled state interact with each other and with the molecules of other materials. "While supercooling is an important phenomenon to study, the challenge is that it's very difficult to supercool water in a lab," said Gallo. In the past, scientists have attempted to address this issue by supercooling water "in confinement," focusing efforts on studying water confined in manufactured pores having a radius of a few namometers (i.e. one or two orders of magnitude larger than the diameter of the molecule of water). This, however, has raised a question of whether the properties of this confined water differ from that of bulk water, where water molecules interact freely in larger volumes. "This question has been a point of ongoing interest in our work," said Gallo. "In previous studies, we have shown that interactions with other chemicals affect only those water molecules that are very physically close to the molecules of another chemical, such as the molecules that make up the wall of the pore. The water molecules at the center of the pore, the free water, retain many of the properties of bulk water." "With this study, we discovered that there are further parallels," Gallo also said. 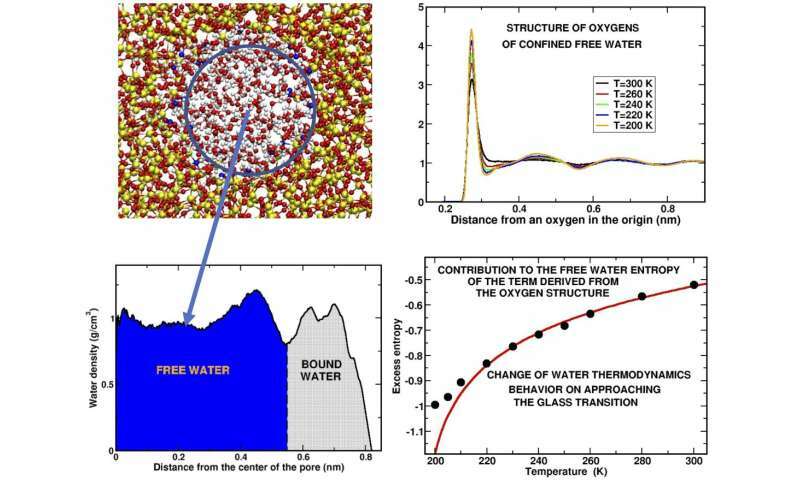 "Specifically, our simulation shows that a property of the structure of the network of water molecules, which can be measured and verified experimentally, can be used to determine the changes in water's entropy, the thermodynamic quantity that measures disorder in a system [...] that may offer insights on some of the more unusual thermodynamic facets of water's activity in this supercooled state." These findings create a framework for other experimental physicists to recreate the simulation with physical samples in a lab. For Gallo and her colleagues, their work offers a foundation for further investigation of the relationships between the thermodynamic characteristics of confined and bulk water. "Water is the most important liquid that we have on earth," explained Gallo. "Any insights that researchers can uncover about its properties can advance not only our collective understanding of physics, but also of biology and chemistry, and open up new possibilities for integrating this knowledge into different technological applications."